It is time for women to seize their destinies and fulfill their calling. 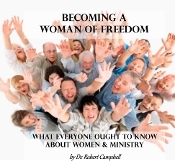 God still uses women today and not just in the Sunday school or women’s ministry roles. Their ministries have been validated over and over again both in and out of the Scriptures. For too long we have neglected the place of women in the church. For too long we have believed what others have said when it comes to some of the more controversial issues in the church. It is time we explored for ourselves these issues and prayerfully make our conclusions based on our study of the word. It is time we studied for ourselves some of the difficult Scriptures. It is time we looked at some of the direct misguided translating of passages that should reflect the role of women. Women ~ Are They Inferior To Men? Women In Leadership; Buried In Our Bias?